In the 1870’s the Lake Road came north into what would become Marshall, branching west to the Four Lakes district and southwest to Section 13 (Cheney). A stone stage way-house sat next to Lake Creek. 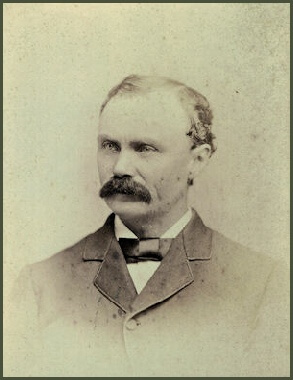 Henry Boston, later of Stevens (Tyler), was there in 1875. He operated a general store near the way-house for three years. 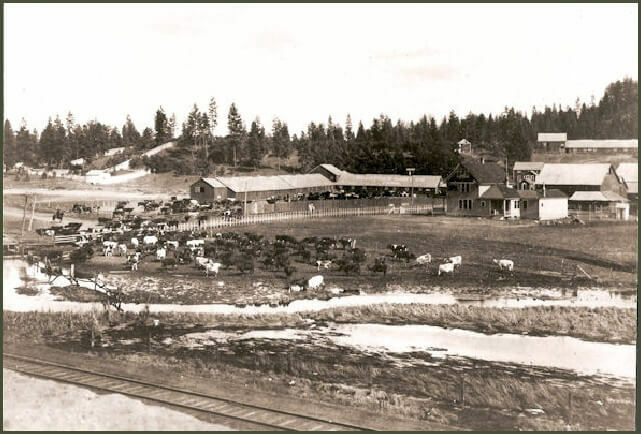 In 1878 William H. Marshall arrived at Section 22 where the meadow meets Lake Creek, eight miles southwest of downtown Spokane and six miles northeast of Cheney. He filed his homestead claim in January of 1880. Having been a lumberman in California, he dammed the creek to form a small lake and set up a water-powered saw mill. The creek and the site soon came to be known as Marshall. The post office at Marshall was established March 26, 1880 with William Marshall as postmaster. Another early settler to the site was W.W. Deakin. By May of 1880, in anticipation of the Northern Pacific Railroad, Marshall became a staging area for laborers and materials. The township boomed and was soon home to the San Francisco Hotel, two restaurants, Boston’s General Merchandise Store, a saloon, blacksmith shop, feed & livery stable, the Palace Meat Market, and William Marshall’s saw mill. That December it was reported in the Northwest Tribune that the people of the Marshall neighborhood enjoyed a Christmas tree and program at the residence of W.W. Deakin. The NPRR track was laid through Marshall by June of 1881. Mr. Marshall’s mill supplied lumber to the railroad as well as many of the businesses and farmers at Marshall and to Cheney as well. 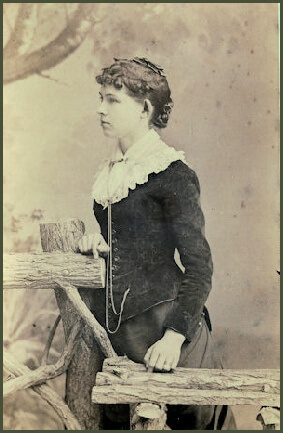 On November 16, 1882 William H. Marshall married Anna Deakin. She ran the store at Marshall for a time. By 1886 Mr. Marshall sold his saw mill operation, but continued to be involved in the flour milling business. The town became the junction for the NPRR line south into the Palouse. Three new saloons were built in town for the railroad gangs. The town was in its heyday, and in 1899 the men organized an Odd Fellows Lodge. William R. Parks bought the Wolverton General Store in 1890 and had the town platted. E.R. 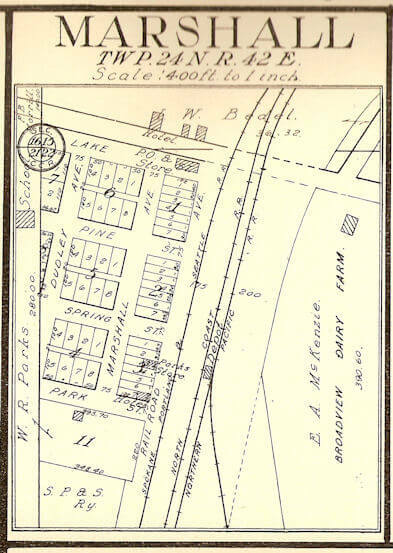 McKenzie bought 250 acres of land from William Marshall in 1891 just east of the railroad tracks. There he started the Broadview Dairy. In 1902 Marshall reported a population of 75. Soon after another railroad line came through the community. This time it was the Spokane, Portland & Seattle Railway Company. Also, around the turn of the century, a little south of town, a convict camp used the water of Marshall Creek to crush rock for road building. The camp became a state prison farm in 1910. Around 1910 Leon Oriard, who had first started a cement factory, opened a dynamite factory at Marshall on the hill above his home. The NPRR built a spur line up into the hill to storage bunkers. By the 1930s there were four companies operating dynamite factories at Marshall. In 1915 the community built a new brick schoolhouse for its children offering classes through high school until 1932. The school continued with classes for grades 1 through 8 until June of 1960 when the district merged with the Cheney School District. The Spokane Greenhouses were built over Marshall Creek in 1918. The water was used to run the coal fired steam heating system. The greenhouse business supplied fresh flowers daily to the Davenport Hotel and other florists and hotels in Spokane. The railroad depot sat just east of town. In 1940 the depot caught fire. The whole town came out to fight the fire. The railroad company used its engines and tankers to help the effort, however, the building was lost. A replacement was quickly built at the same site. There was twice daily passenger service to Spokane from Marshall. A gas powered one car mail coach which looked like a trolley was called The Bug. For 35¢ you could ride The Bug to Cheney, Spokane, or out to Coulee City. Weekend passenger service from Spokane went down to Washington State college at Pullman. In the 1940;s, Mr. and Mrs. Bingham ran the general store and post office. The first gas pump in town was also located at the store. The post office was located inside the store. For many years it had the distinction of being the smallest post office in the state. In 1950 a new bridge was built over the creek and railroad tracks, and a new road was graded on the hillside diverting traffic west and around the town. In 1956 a new church was built at Marshall by the citizens. The bricks were made locally using water from the creek. Many building and homes in Marshall used the local brick or cement blocks in their construction. While the school and other businesses of old are gone and the Marshall Store closed in 1988, the post office is still active in Marshall. This History of Marshall, Washington was produced by the Marshall Community Coalition in 1994 on VHS. While it is a little fuzzy, the video gives a nice overview of the community’s history.